Dynaudio Excite X14 review | What Hi-Fi? At this price, speakers come in all shapes and sizes. At £945, the X14 is the entry-level model in Dynaudio’s updated Excite range. It’s a compact design, which features technologies and materials developed and built in-house in Skanderborg, Denmark. The result is a weighty, beautifully made and entirely humdrum-looking pair of cabinets. 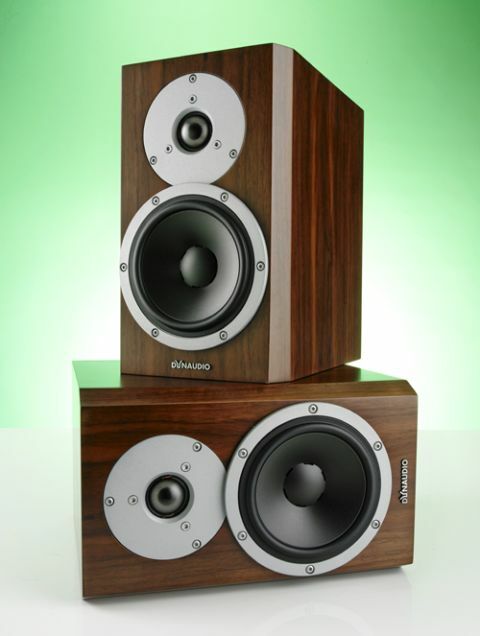 As is usual for Dynaudio, the mid/bass drivers are well-engineered pieces of equipment. They use the company’s favoured magnesium silicate polymer cones, and employ aluminium wire voice-coils for longevity and lightness. Sitting above them are coated fabric-dome tweeters. Both drivers sit in a compact cabinet finished in real walnut or rosewood veneer, or a more modern lacquer in satin black or white. The X14s are beautifully made, if a little understated. The number of visible screws on the front suggests an attempt at a more industrial appearance, but up against the fancy rose gold of the KEF LS50 or the shininess of Monitor Audio’s Gold GX50s, the Dynaudios look a little humdrum. Elsewhere it's business as usual. Above the single pair of binding posts at the back of each cabinet is a generously proportioned bass reflex port. Straight from the box the X14s sound a little boxy and closed-in. Run them in for around 100 hours, however, and they sound more like you’d expect for £945. What's immediately apparent is the speed the Dynaudios operate at. Fed a pacy tune like Ian Dury's Sweet Gene Vincent the X14s crack along, snapping into the leading edge of sounds and not letting decays hang around too long rither. The song isn't forced along, but the Excites get on the front foot early on and never let the pace drop. A switch to the more pedestrian (though no less charming) One by Johnny Cash lets the Dynaudios demonstrate their other big strength: the remarkable purity of their midrange reproduction. His voice (which was rather approximate by this stage, although ever more loaded with feeling) is locked into the centre of the soundstage and absolutely loaded with nuance. The subtlest inflections, the palate noises and whistle-y esses are delivered with assurance. In fact, every vocalist is treated with equal care and confidence. Further up the frequency scale there’s a crisp, detailed top end and an impressive level of agility. The X14s do an admirable job of keeping up with the frenetic drumming of Mombasa from the Inception soundtrack. Elsewhere, the Dynaudios put out a wide, convincing soundstage with solid stereo focus. Tonally they’re clean and neutral when positioned in free space. Put them too close to a rear wall and the low frequencies (which are as swift and taut as the rest of the frequency range) can become muddled. Otherwise the Excites prove a refined listen (subject to recording quality of course). This level of sophistication doesn't lend itself to producing an all-round, across-the-board loudspeaker though. Up against the Martin Logan Motion 15s, the Dynaudios are a little heavier of foot, with a bass performance that doesn’t take tight turns as well as the midrange and treble. The X14s aren’t the most attacking speakers we’ve heard, either, and they aren't all that comfortable when the going gets grimy. Play something rough and dirty like Tom Waits’s Hell Broke Luce and they feel a little conservative, not entirely succeeding in conveying a sense of vigour and drive. If you need your new speakers to offer a bit of bite and bile, the X14s needn't trouble your shortlist. Where they're good, though, the Dynaudios are very, very good. Stick to music that doesn't fluster them – well recorded material that deson't demand much in the way of dynamic headroom – and they're among the crispest, cleanest and glossiest performers this kind of money can buy. If only they were more dynamic and a little more versatile, these could be truly great.